After posting our journal entry about Tunisian food, we've been going out of our way to try new things in the hopes of varying our cuisine. 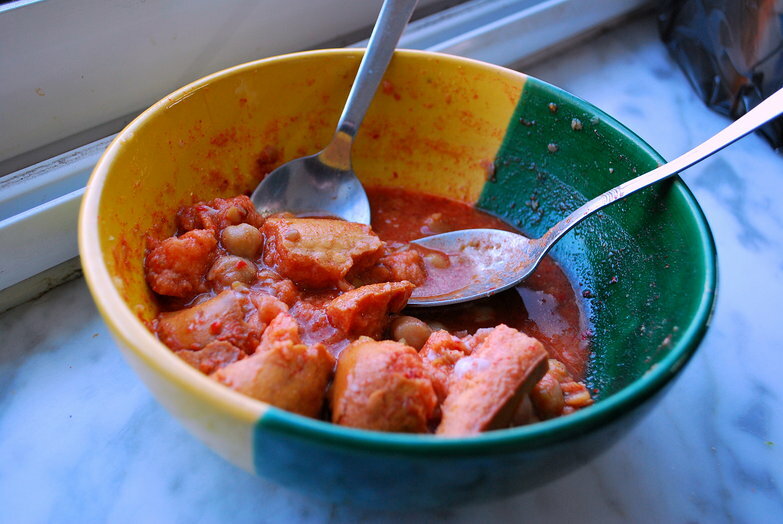 In the process, we've discovered lablabi, which turned out to be my favorite Tunisian dish we've tried thus far. It is a sort of impromptu chili sold at hole-in-the-wall restaurants around the country, easily recognizable by the giant metal stock pot heating over a gas burner, and the pretty ceramic bowls stacked nearby. To prepare the dish, the person running the restaurant hands the customer a bowl with a long piece of day-old baguette in it. While they prepare the rest of the lablabi, the bread must be broken into bite sized pieces until the bowl is full. Meanwhile, the server points at various items you can have in the soup. It starts several large spoonfuls of spicy harissa. Next comes a few spoons of olive oil, some chopped garlic, a little bit of salt, and a bit of cumin. Why they chose cumin for this dish and not any number of other spices, we're not sure, but it really does make the final product taste reminiscent of American style chili. All of these ingredients mixed, the server then adds a large ladleful of garbanzo beans from the giant metal cooking pot, along with a generous amount of the liquid the beans were cooked in. This whole brothy beany mixture gets poured over the bread. You can also add tuna, olives, and egg, but I prefer my lablabi without any of these things. Yum! Oh, and it only costs 1 dinar for a huge bowl! Even though work blocks out about 80% of your flickr photos, just the description alone made this sound really good! I could go for some good chili, it's so cold!